For hardwired systems, wires are terminated on one end at the security panel and on the other end at each motion sensor, camera, keypad, and window or door contact. The wiring is usually configured in zones using a star or homerun topology. An NC loop (zone) may pick up less noise than an NO zone. Provided both aren’t cut through simultaneously, the alarm will not go off if an intruder cuts through the wires of an NO zone. This isn’t the case with an NC zone-wired design. Used to connect the security camera to the security system itself, to connect the security system to the residential network, and sometimes to supply power to low-voltage devices like CCTV cameras. Used to connect cameras to the video distribution system, which can include video monitors and VCRs for taping purposes. If the system includes a fire alarm, use either fire power limited plenum (FPLP) cable, which is designed for use in ducts, or fire power limited (FPL) cable, which is designed for general use (see 760.61 in the NEC). Bear in mind, the transformer used in most security system control panels is a UL-Listed Class 2 device, which requires Class 2 low-voltage wiring. Hard wired – hard wired systems are installed inside your walls with actual wiring rather than a wireless system which involves no wiring. 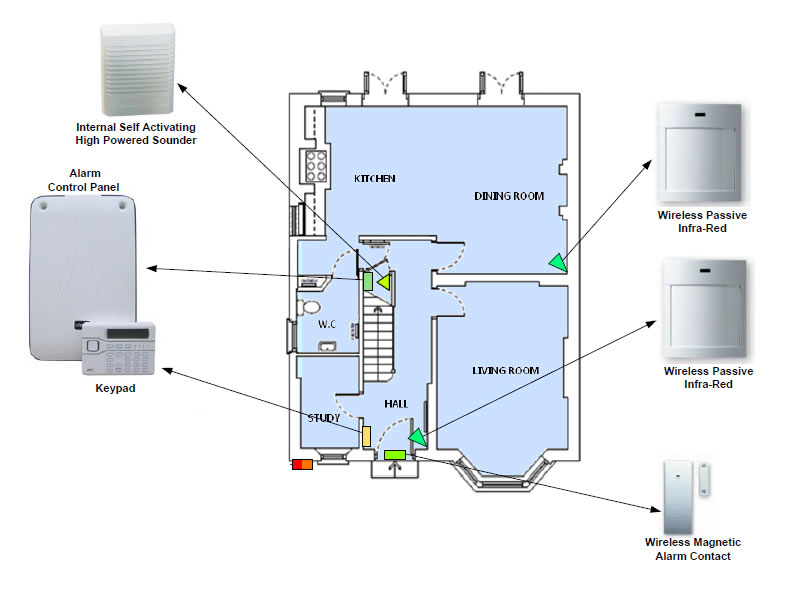 Wireless – in a wireless system the components (sensors) of your system are wireless, as opposed to being hard-wired into your home. 100% Wireless – More important, and this is often missed, is that you are on a 100% wireless system. What does this mean? It means the connection between both your sensors and control panel, as well as control panel and monitoring station, are all wireless. Cable (broadband) – cable alarm systems use your Internet connection. Dedicated Cellular – a cellular system, while slightly more expensive, is also our recommended type of security system setup. Why? Because it uses a dedicated two-way cellular network (not the same network your phone uses. Battery Backup – Make sure your control panel also has battery backup – so if you lose your power, your security system stays online. Smash and Grab Protection – When your house alarm goes off, a signal is sent, and when you disarm, a second signal is sent.